Spain hinted it wants to receive fewer refugees from European Union border areas than it had agreed, arguing the requirement was far less. MADRID: Spain hinted Tuesday it wants to receive fewer refugees from European Union border areas than it had agreed, arguing the number of people needing relocation was far less than thought. The EU in 2015 approved a plan to share out 160,000 refugees already on European soil, mainly in Italy and Greece, across its 28 states to tackle the continent's worst refugee crisis since World War Two. Spain had agreed to take in 16,200 refugees -- around 10 percent of the total -- within two years but only 1,100 have resettled in the country so far. "The reality is that currently there are not 160,000 refugees that meet the criteria laid down in EU decisions," Foreign Minister Alfonso Dastis told a parliamentary commission. 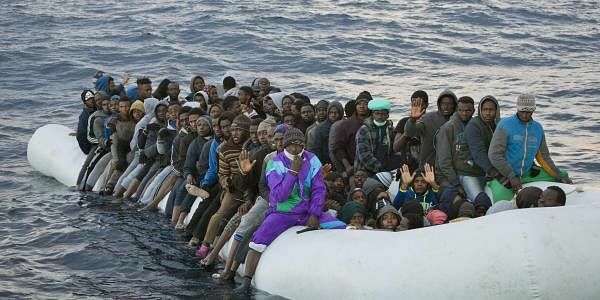 "There are no refugees in Italy. There are illegal immigrants," he said. "In Greece there are 55,000 to 60,000 refugees, this is why I think it would be reasonable to set targets according to this figure," he added, suggesting that Madrid wanted to revise the number of refugees it receives under the EU agreement. Tens of thousands of people marched through the streets of Barcelona, Spain's second largest city, on February 18 to urge the Spanish government to immediately meet its pledge to take in thousands of refugees.